In continuing “Does Big Brother have too much of our data?” news: John Hancock, a US life insurance company, announced on Wednesday that all policies will now give incentives for people to send the company fitness tracker and other wellness data. The company “will stop underwriting traditional life insurance and instead sell only interactive policies that track fitness and health data through wearable devices and smartphones,” according to Reuters. John Hancock, which is owned by Canadian firm Manulife, is now bundling all of its policies with a program it has been letting customers choose to use voluntarily since 2015, called Vitality. The Vitality program sounds a little bit like a mash-up of store loyalty points and the Hunger Games. For example, there is a wheel you can spin after you work out a certain number of times or log healthy food purchases. It then allows you to win gift cards for places like Amazon or REI and discounts on fitness trackers. While all the new policies are being sold with the Vitality program attached, people don’t have to opt into using the data tracking. But they are highly encouraged to do so by those freebies and the enticement of decreased premiums. Free stuff is very compelling, as those people who got Domino’s tattoos in exchange for free pizza for life can attest. A company using what seems like a fun smartphone game to get you to walk more might be a slippery slope. With access to all that data, what will a big corporation ultimately do with it? This is still new, so the implications are murky. When a life insurance policyholder dies, the company pays a lump sum to the living spouse or children. So life insurance companies want to keep you alive as long as possible so that you keep paying your monthly premiums. It’s a double whammy for them when you die: not only do they lose your premiums, they have to pay your survivor(s). Tingle told Reuters that it is too early to know, based on its earlier users who opted into the voluntary Vitality program, if the company has saved money so far. But the company thinks it will pay off. Data from other countries where the Vitality wellness incentive program is used suggest that participants live “13 to 21 years longer than the rest of the insured population,” Tingle said. Multiply that by a few thousand dollars a year for each person, and you can see why John Hancock wants you, quite literally, alive and kicking. There’s thus far no evidence that the company will raise your rates if you don’t exercise enough, but it’s a reasonable fear at this point. 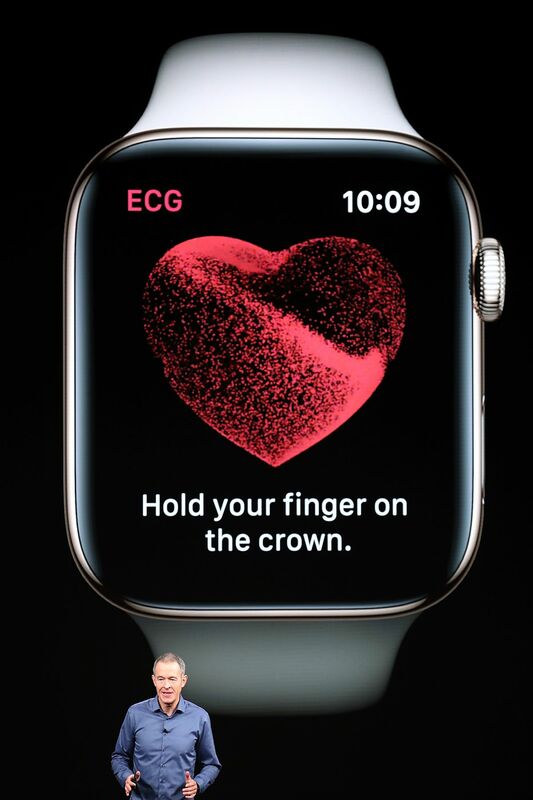 Jeff Williams, chief operating officer of Apple, announces the new ECG feature on Apple watches at an event on September 12, 2018. This John Hancock news comes on the heels of two recent big announcements related to wellness and health tracking. Fitbit announced Wednesday that it will expand its programming options outside of just selling to consumers. Employers and health plans can now purchase Fitbit Care for their employees and members. This service provides its wearables to members, offers a social network with fitness challenges and other contests, and provides coaching for things like smoking cessation and weight loss, Fast Company reports. And Apple announced on September 12 some new health features in its Apple Watch, including that it will be capable of taking electrocardiogram readings of your heart. This is much more information than you would ever need to, say, reach your next fitness goal when running around your local park. Surely some for-profit health entity — like an insurance company! — will figure out how to monetize this. The New York Times reports that there’s also an incentive program wherein if you meet certain goals in a 24-month period you get the Apple Watch for free, otherwise it reverts to a payment plan and charges you. So tech companies have more incentive than ever to keep producing trackers with more and more invasive features. Data privacy, and the breaches and misuses that occur, is becoming a concern everywhere from social media networks to your Alexa. Giving your data to people who have a financial stake in that data is a potential slippery slope. “While self-knowledge may be the rhetoric of wearable device advertising, it is just as much a technology of being known by others. With more detailed information, far more individualized and precise interventions can be conducted, with the potential for political and cultural impact,” Crawford writes in a 2015 paper comparing old school scales to fitness trackers. The insurance companies can use this data to potentially weed out bad health-risk customers. A John Hancock representative told CNN it may use the data to try to sell customers other products like retirement plans. And it already charges less for people who are healthier. While the insurance market is heavily regulated, we’ve already seen what can happen when insurance premiums are left up to the whims of a free market.